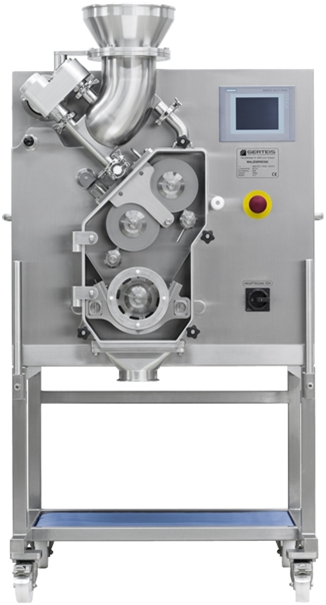 Jona, Switzerland: – Dry granulation expert Gerteis will return to America’s high prestige INTERPHEX 2018 expo in New York for the eleventh year in succession to showcase its cost-effective roller compaction solutions. The Gerteis display at booth 1952 will feature live demonstrations of its latest generation Mini-Pactor® and Mini-Polygran® Plus machines. Designed primarily for R&D use, both machines will show their capabilities for small-scale continuous production, using constant ribbon measurement with no uncompacted fines. Mini-Pactor® and Mini-Polygran® Plus will run constantly throughout the show with individual customer demonstrations available. 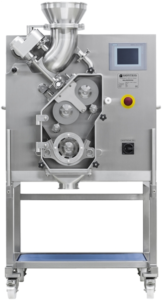 “INTERPHEX remains our key show for the USA, giving us a great platform to show our high containment roller compactor technology to the North American market,” President and CEO Paul Gerteis, who will be on stand for all three days of the show. “We will be able to demonstrate our expertise in continuous manufacturing and impressive application knowledge to a highly expert audience of CRO and CMO scientists and technical decision makers looking for faster and more reliable technologies,” said Mr. Gerteis. “Our clients look for effective containment, advanced roller compactor technology, reliable continuous manufacturing capabilities and leading edge application knowledge, all of which we can deliver with Mini-Pactor and Mini-Polygran Plus ,” he added. “This is also a great chance to say thank you to our customers for another successful year,” said Mr. Gerteis. The new HMI package and PLC-based redesign also features on the latest models of the Mini-Polygran® Plus and upgraded Mini-Pactor. The Gerteis display will also include representation from UK-based ChargePoint Technology Ltd., whose patented split butterfly valves and containers form key elements of the total containment roller compactor solution. Over the course of almost four decades, America’s International Pharmaceutical Expo (INTERPHEX or IPX) has become one of the world’s leading single source events for biopharmaceutical and pharmaceutical manufacturing and processing solutions and technologies. The Expo aims to showcase the full range of state-of-the-art solutions needed for cost-effective product development and manufacture, including equipment, accessories and technologies while offering networking and peer-to-peer sharing opportunities, presentations and interactive demonstrations. INTERPHEX 2018 is a three-day event opening April 17, once again at the Javits Center in New York City. The event will feature more than 620 vendors and is expected to attract some 10,500 pharmaceutical and biopharmaceutical industry professionals. IPX is sponsored by the Parenteral Drug Association (PDA) and organized by Reed Exhibitions with more information at: www.interphex.com. Click on Gerteis at INTERPHEX 2018 for more information.